The U.S. Green Building Council (USGBC) has recognized the Pringle Creek Cottage at 1826 Cousteau Loop, SE in Salem, Oregon, built by Bilyeu Homes, Inc, as receiving a LEED (Leadership in Energy and Environmental Design) Platinum certification under its LEED for Homes pilot program. LEED for Homes is a USGBC green homes pilot program that evaluates the environmental features of single and multi-family homes. 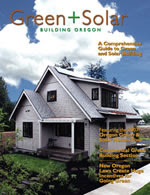 Earth Advantage, Inc is the recognized Northwest LEED for Homes Provider. LEED certified homes are designed to be energy efficient, environmentally sound, resource friendly, and healthy places for its occupants. This home is also certified as Earth Advantage® and ENERGY STAR® as well. It is currently the highest scoring LEED for Homes project in the nation. This home featured a number of energy and environmental features that reduce the house’s impact on the environment, not only in the construction of the home, but also in the operation and maintenance of the home. The features that reduced the houses impact on the environment are:- Daylighting and cross ventilation- Rainwater harvesting system to be used for irrigation of the landscaping- Solar hot water system- Photovoltaic system- Geothermal heating system tied to a community well- Energy Recovery system- Premium air filtration system- Use of Forestry Stewardship Council (FSC) certified wood throughout the house- Locally produced materials such as Pacific Madrone hardwood floors. The home is a model home for the Pringle Creek Community in Salem, Oregon and was designed in conjunction with Opsis Architecture of Portland. Pringle Creek Community has received nation recognition by the National Association of Home Builders as the "Land Development of the Year."